British TV is renowned for its excellent crime shows, such as Dalziel and Pascoe, Silent Witness, Wire in the Blood, New Tricks, Life on Mars and Broadchurch. Which do you think has been the best one so far? 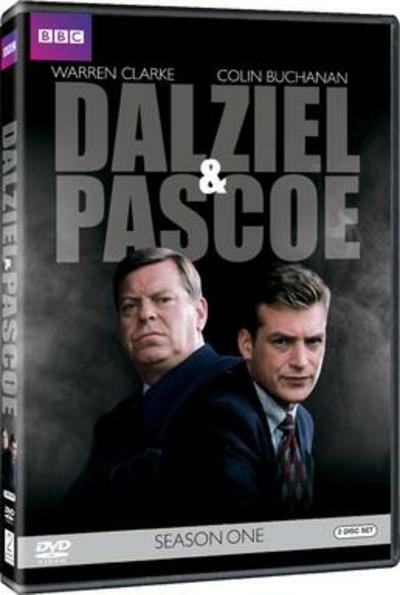 Cover of Dalziel and Pascoe DVD release. My favourite would be Dalziel and Pascoe, not for the mysteries but for the characters. I also loved Life on Mars and Ashes to Ashes, though I suppose they're sort of sci fi as much as crime shows. Well - if it comes to Crime you can't but not think of 'The New Avengers!" Rather enjoyed that show! I don't really watch series, but my c parents watch a lot of themI tend to see quite a lot without intending to. I think Father Brown is quite good, as is a Touch of Frost. My husband is a fan of British crime series. We regulalry watch Midsomer Murders and Touch of Frost. Not Lewis though, because I really donlt like that. Midsummer murders, A Touch of Frost, Morse, Lewis and Silent Witness are my favourites. Sometimes Father Brown when it doesn't clash with one of my favorites. At the moment it is Sherlock, but I love most of them. Nobody does it like the British. The characters are real, the attention to detail superb and the scripts are tightly written. The Americans can't hold a candle to them. Silent Witness, and now Happy Valley was sooo good, violent, but like Broadchurch the people involved are to me at least, like 'real' people. Yes, Sandw, how could any show with Sir Derek Jacobi in it be no good???? Lost interest in 'New Tricks' when the fabulous James Bolam ('When the Boat Comes In') left. Then Alun Armstrong; saw him on stage in London, 'Les Miserables', he played Thenadier, & has a wonderful singing voice. Now Amanda Redman's gone. Don't like the two new male actors in it. Tamzin Outhwaite is a good actress ('Red Cap'), but not enough now for me to keep watching. Oh dear! There're just SO many good UK crime dramas.'. Love them all, BUT the best has got to have been 'inspector Morse'! Just the 'bees' knees'.... John Thaw WAS Morse! That's the way UK ones' are SO good.....Michael Kitchen IS 'Foyle', Sir David Jason IS 'Frost' et al. And the late, great Warren Clarke, 'Dalziel' to a 't'! First saw him in 1982 UK series 'Jewel in the Crown'. He played the batman to the corrupt Police Insoector, played by Tim Piggot-Smith. Just can't get enough of the UK crime series'. So happy they're continuosly 'repeated' on the telly! We like Midsommer Murders, Death in Paradise and Father Brown. I love all British Who-Dunnits. MidSomer Murders, Frost, Poirot and Morse. As John Thaw passed away, we now have only re-runs. The new Insp. Barnaby is very good - just not quite as good as the first Barnaby, I think he needs to be a little bit naughtier (cheating on diets etc), but the body count is great! Miss Marple needs a much more believable Miss Marple/. Margaret Rutherford was the first and very best of all. ONLY the Brits can do Who Dunnits well. Remember Hamish McBeth? What a dish! Not too many people around who remeber Margaret Rutherford. You should read the book on her life; she had a very 'strange' marriage! Of the more recent actresses playing Marple, Joan Hickson was THE best! Geraldine McEwan, who only died five weeks' ago, was next best. Although she's always been a good actress, Julia McKenzie ('Fame is the Spur' UK drama tv series'), I just can't take to her as Marple! Maybe she's way too young! Interestingly, I found Geraldine M. a tad insipid, yet her blue eyes were stunning. which was a very good ploy! She was a stage actress as well. Google her & read the 'Wikipedia' info. I love to watch Midsomer Murders, I haven't watched an episode that was not interesting and entertaining. I loved to watch the Old Sherlock Holmes Series, again quality. Farle, do u mean the 1 with Jeremy Brett? He was brilliant, & THE epitome of Sherlock. None better, IMO! Cheers! I've watched just about all of the shows mentioned below, You can't go past British Crime, I don't think anyway. I watched all the New Tricks episodes, until the cat changed. My husband would only watch Sherlock Holmes, as in tv drams. I've now seen 109 episodes of Midsomer Murders. I watch them on iview, so we can watch SBS shows together.